Jarnail Singh, Delhi AAP MLA and Co-incharge Punjab Affairs of Aam Aadmi Party addressed AAP Inquilab Rallies at villages Galib Kalan and Manukey in Jagraon Assembly constituency today. 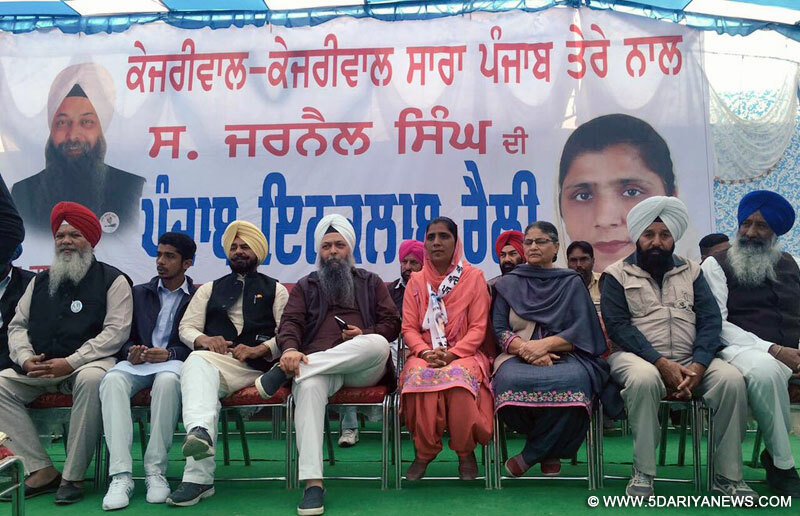 S. Jarnail Singh also participated in the Aam Aadmi Party event at Macchian Kalan where Gurchet Chitrakar staged his play “Assi Bolaange Sach”.In Jagraon constituency, AAP Inquilaab rally had an unprecedently massive turnout of villagers and S. Jarnail Singh slammed SAD-BJP and Congress both and held them responsible for completely damaging Punjab through the different mafias. He alleged Badals and Amrinder had never thought of the welfare of people, but amassed enormous wealth through corruption and drug trade and nourished their clan. Badal and Amrinder are both responsible for SYL mess and now trying to exploit sentiments of the people of Punjab . Jarnail Singh reiterated that SAD, BJP and Congress are hand in glove against AAP and extolled the public to this time vote for yourself. He expressed his grief that Unemployed youth are being forced to take take drugs and promised that as soon as AAP comes to power, Drug dealers will be put in jails.S. Jarnail Singh told the gathering that Delhi Govt all its promises on Education and health and Education and health be improved in Punjab too.Among those who spoke were AAP Jagraon MLA Candidate Sarvjit Kaur, AAP Ludhiana West MLA Candidate Ahbaab Singh Grewal, AAP Ludhiana Zone Observer Darshan Singh Shankar, Jagtar Singh Jagtar and Amarveer Singh.At Machhian Kalan, S. Jarnail Singh with AAP Sahnewal Candidate Harjot Singh Bains witnessed the play Assi Bolaange Sach by Gurchet Chitrakar which depicts current scenario of the state along with Narinder Kaur Bharaj and Sukhwinder Singh Sukhi.